July 7th was Tanabata, and the Seattle/Tacoma Kimono Club had a great time celebrating tanabata wearing yukata at the Seattle Japanese Garden! I will post photos soon, but I wanted to post the local Obon schedule as soon as possible. The STKC is planning a meet-up at probably the Tacoma Bon Odori, however it anyone wishes to meet-up at the other Bon Odori festivals, let us know! The dates for each location are different, so at least one or more of us would be available to meet-up at the other festivals! Obon is a joyous festival in Japan that celebrates ancestors and those who have past. 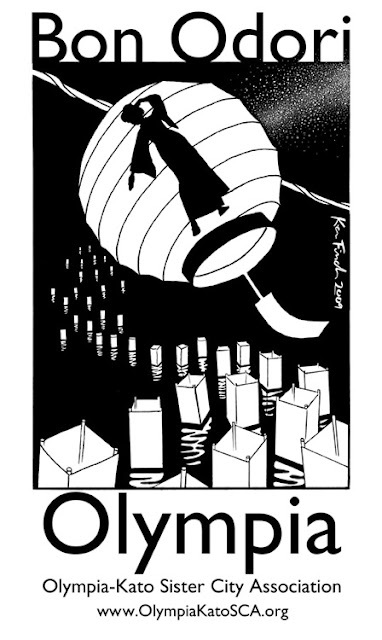 Obon consists of a street festival, bon odori (dancing), and tōrō nagashi (floating of paper lanterns), and fireworks. People also clean and visit their family grave sites during obon season. 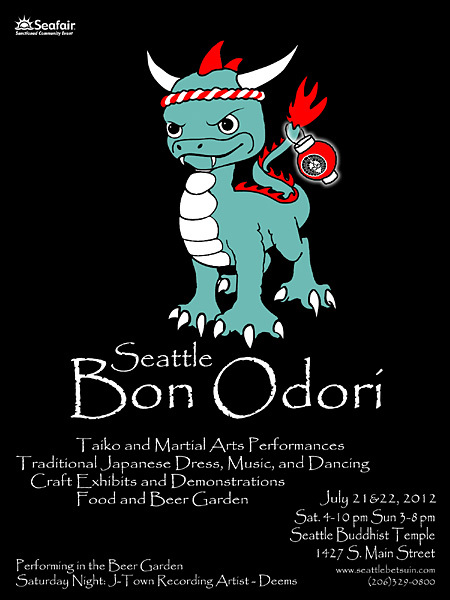 Bon Odori is arguably the largest and most popular Japanese festival in the Seattle area. In our area, there are four Bon Odori festivals in the area, in Seattle, Tacoma, Auburn, and Olympia, and all of them fall on different days. 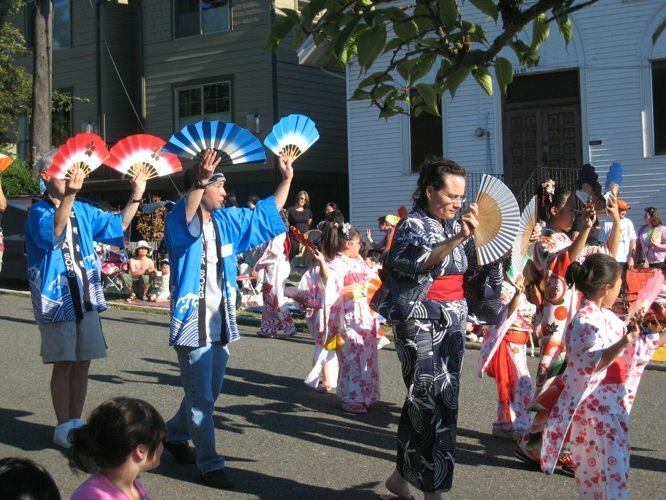 Seattle is by far the largest of the Bon Odori festivals. Below are the schedules for Obon festivities in our area. 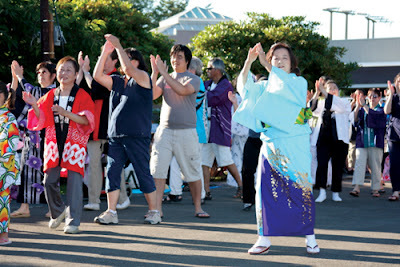 I hope you can dress up in yukata and dance at one of our local Bon Odori festivals! Each of the three Buddhist temples that are holding Bon Odori are also holding dance practices for anyone who would like to learn the dance moves ahead of time. You do not need to go to the dance practices in order to dance at Bon Odori, however it helps you feel a little more confident if you plan to dance. The same dances are done at each of the 3 Bon Odori festivals, so you can go to which ever location is best for you, even if you plan to attend the actually Bon Odori at a different location. The largest of the local obon festivities. Main event is dancing in an oval around the street, around taiko drummers, and wearing yukata (though some people wear kimono and other wafuku, or regular clothing). Also there is food booths serving food made from scratch using the temple's very old recipes, kori shaved ice, beer/sake garden, martial arts, craft exhibits, and demonstrations. The White River Buddhist Temple has already released their set schedule for Bon Odori, I will list the schedule below. They will also have food booths serving: gyudon (beef bowl), Spam rice balls, cold somen noodles in broth, kori shaved ice, hot dogs, mochi, pies, and cold drinks. You can read their event flyer here. Dancing, food, and drumming, similar to the other festivals. This festival will conclude with a candle lighting ceremony. If you would like to participate in the candle ceremony, you can find more information about it here. From 4-9pm, food booths open at 5pm, dancing begins at 7pm. Lantern floating ceremony, tōrō nagashi often brings Obon festivities to a close, and often commemorates those lost in the bombing of Hiroshima. 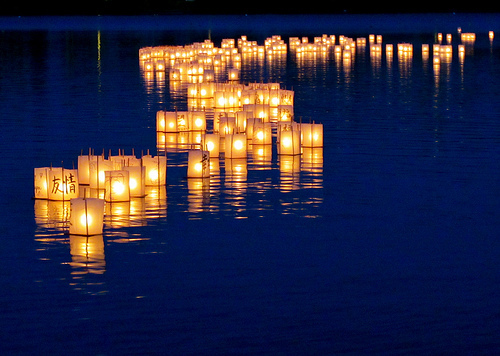 In Seattle, the tōrō nagashi, "From Hiroshima to Hope", is held every year at Green Lake, and you can make lanterns to honor loved ones who have past on or to honor victims of tragedy..